Thermocouples and RTDs are the most common sensors used in process temperature measurements. Simulating a process sensor signal into a process instrument or control system input enables a technician to verify whether the device responds correctly to the temperature measured by the instrument. There are many different ways to simulate these sensors for testing purposes. You can use a mV dc source and a mV vs temperature look up table for simulating thermocouples or a resistance decade box and resistance vs temperature look up table for simulating RTDs. This method, however, has become outdated with modern temperature calibrators that do the conversion for the user. With modern calibrators, simply select the sensor type to simulate, input the temperature to source and connect to the devices under test. Disconnect the process measurement sensor and connect the test connection wires in its place (Figure A). Connect the mini-connector from the test wires to the TC source connection of the calibrator. Connect a DMM or other measurement tool to the tested device’s mA output. Verify the devices range or span. Apply the 0% value with the simulator and verify with the DMM that the output mA value or voltage is as expected. Repeat the test, applying the 50% and 100% temperature signals. If the measured output of the device is within limits, the test is complete. If not, adjust the device at zero (offset, 0%) and span (gain, 100%). Repeat steps 4 and 5 and verify for a correct response. Connect the calibrator to the device input as shown in figure B.
Connect the calibrator output with the right combination to match the device configuration (2, 3 or 4-wire). Use the test procedure at left for thermocouple testing, starting at step 3. 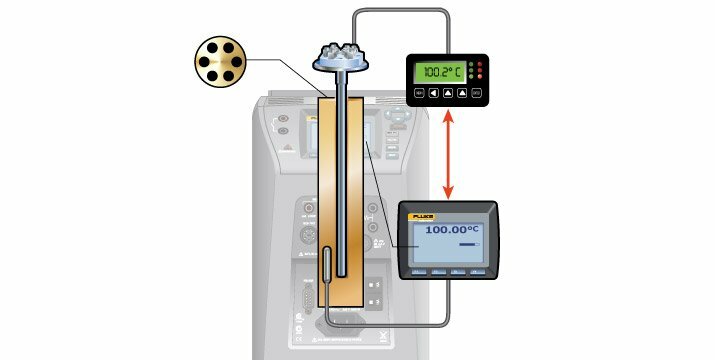 Find this app note including helpful Tech Tips along with ELEVEN other application notes all in one convenient Temperature Calibration Guidebook, for FREE.